EDMONTON - The silver lining to the Grey Cup cloud that has seen the Edmonton Eskimos fall back into the West Division pack over their last six games is they can get a foothold and stop the slide against teams they're now battling for playoff spots. That has to start Saturday against the Winnipeg Blue Bombers. Once in hot pursuit of the Calgary Stampeders for first, the Grey Cup host Eskimos have gone 2-4 in their last six games and are now 7-6 as they take on the 6-7 Blue Bombers at Commonwealth Stadium in a game that falls under the must-win category for both teams. "Honestly, I've been in the situation where you have to depend on other teams and it's the worst feeling in the world,'' linebacker J.C. Sherritt said. "To control your own destiny as a competitor, as a team, it's all you can ask for. The Eskimos are coming off a 28-15 loss against the Ottawa Redblacks. The Blue Bombers stayed in touch with the playoff pack by beating the Montreal Alouettes 31-14 their last time out. The Eskimos play the Blue Bombers Saturday and host them again Nov. 3. Edmonton beat Winnipeg 33-30 to open the season. "Everything is must-win for us,'' Eskimos receiver Duke Williams said. "We know we put ourselves in a hole, but we knew this wasn't going to be easy, either. We love challenges. That's what it's going to be. Edmonton's other games are against the 8-5 Saskatchewan Roughriders, the 6-6 B.C. Lions and 8-5 Ottawa. Simply put, while the 10-2 Stampeders and first place are out of reach for all intents and purposes, the Eskimos have a say about how the West Division playoff picture unfolds and their place in it. Whether the issue has been slow starts, bad finishes or untimely penalties - the difference against Ottawa was seven field goals by rookie kicker Lewis Ward - the Eskimos simply haven't been able to get any traction since a 5-2 start. "It's been ups and downs for sure,'' quarterback Mike Reilly said. "Last year we were a streaky team, going on long win streaks, long losing streaks, back to winning streaks. 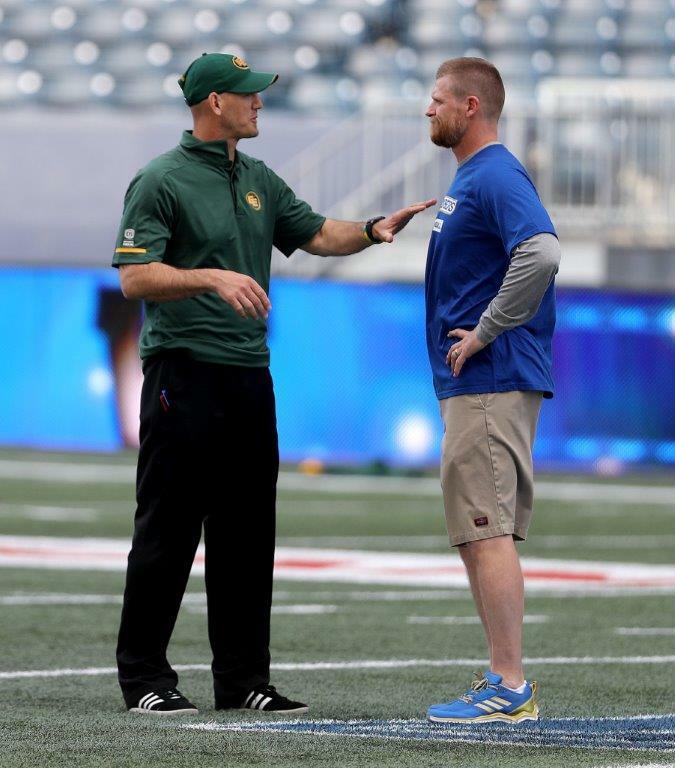 The Eskimos are 5-1 at Commonwealth Stadium and 2-5 on the road. Finishing in second place would get them at least one playoff game at home, but first things first. "Trying to find that consistency,'' Reilly said. "Trying to figure out how to do it week in and week out. Certainly, you can't do it all at once. You've got to come out and take it one week at a time. JUST WIN: The Blue Bombers snapped a four-game losing streak with their win over Montreal on Sept. 21, but they've yet to beat a team with a winning record this season. Four of their six wins have come against the Alouettes (3-10) and Toronto (3-9). The Blue Bombers are 2-4 on the road. BACK AT IT: Winnipeg running back Andrew Harris, second in CFL rushing with 1,028 yards, left the game against Montreal with a knee injury but was back practising Wednesday and will start. So will linebacker Adam Bighill and receiver Darvin Adams, who were also banged up against the Alouettes. LAST TIME: The Eskimos' 33-30 win over the Blue Bombers in Winnipeg on June 14 was decided on a 44-yard field goal by Sean Whyte with 13 seconds remaining. Twice delayed by lightning in the area, the game took a CFL record 5 hours 40 minutes to play. ODDBALL STAT: The Eskimos are tied with Calgary for second in the league with 42 touchdowns (Winnipeg leads with 43) and all of them have come on offence. Edmonton is the only team without at least one touchdown from their defence or special teams. Don't know if this will get posted .. but game of the week? .. ok.. rider fan here and watching the stamps do what they're supposed to do to toronto.. haha Marc Trestman isn't so good without a quality qb simple as that (see rex Grossman Chicago Bears who was . . Well gross ) .... He's not a magic maker nor a qb whisper er .. he's just a cog who obviously is being out classed and out coached this season.. now yes we beat Calgary but I'm still jealous how Calgary and they're team of back ups steam roll the wanna bes when we rely on a kicker miss to win.. Ottawa.. ugggh.. some teams don't match up.... Grey Cup goes through them .. like we match up against the stamps .... I'll always cheer for our boys .. hopefully Zack ( Im pro Zack btw) can find the magic Darian used to against a dominant stumps team when it matters .. go riders ! !